Different organizations follow several approaches to marketing food to children, these advertisements are not only done on the television, but on the radio, magazines, Internet, product placement in video games and movies, on product packages, in schools, on clothing, as toys, and almost anywhere a product image or logo can be displayed. Many of the techniques utilized follow the use of celebrities, spokes-characters, collectible, games, cartoons, contests, premiums, kids’ clubs, and many others. 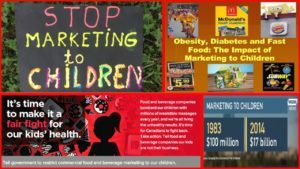 These effects have led to controversial issues that portray the ethical issues relating to food marketing to children. Therefore, led to over $10 billion spends on food marketing to children in a year. (“CSPI”) Because food marketing follows different tremendous approaches to attracting children, children are therefore enticed to embrace various kinds of food which pose a threat to their health. Children are facilitated with food marketing strategy with the use of toys. While there are many approaches to food marketing to children, the giveaway of toys to children when they purchase fast food at various restaurants had become a bait for attracting children to get caught into the detrimental factors food marketing. According to Otten, et al., 2012, the use of toy and incentive distributions is becoming pervasive and increasingly popular in many restaurants in the country. A survey from the Federal Trade Commission showed a 2006 estimation that about ten restaurant chains expand up to $360 million to purchase toys that would be used and distributed with meals taken by children and also sold more than 1.2 billion meals with toys to children in the age bracket less than 12 years. With children spending more hours watching television and other media devices, they are exposed to several kinds of food advertisements that are eye-catchy and fascinating to them. According to Linn 2004, she stresses that when a two hour program is held on the Cartoon Network or even Nickelodeon, there are about twenty to forty food commercials within these hours, or one every minute. These food commercials advertise foods that contain a very high percentage of calories, sugar, salt, and fat. (Kotz, et al., 1994) The effectiveness of television advertising on infants and growing kids can be very overwhelming. Children always love to eat what they see in advertisements and they tend to buy these things when they are with their parents. It is generally noted that parents spend more during shopping when they are with their kids, compared to when they are not with them. During such shoppings, children manifest the wrong misconceptions they see on the television to requesting for food products and take food with increased calories. After a long survey of this development with respect to the media, the United States have been able to regulate marketing to children to an extent. (Briggs, 2003) In some other parts of the world like Norway and Sweden, food marketing to children under twelve had been banned. 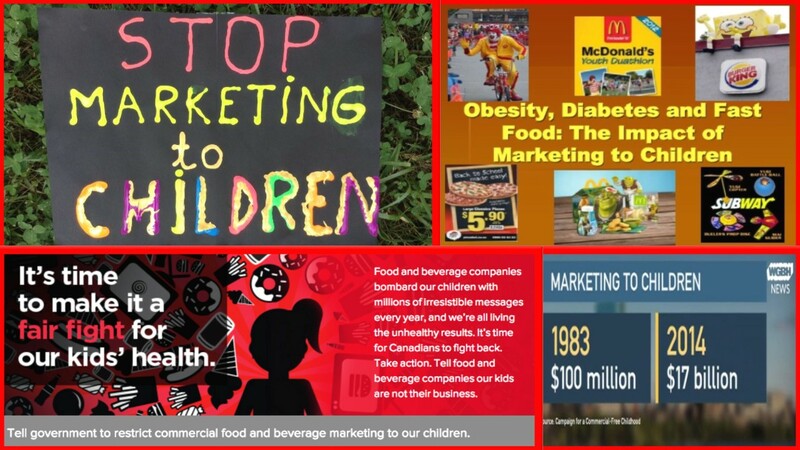 Even in Canada, marketing food to children under 13 had been banned. Finland also bans advertisement related to children. While New Zealand bans marketing junk food to children. Additionally, the British Broadcasting Corporation had kept aside any connection between kids’ programs and related junk food companies. (BBC, 2004) Therefore, marketing food to children has to be restricted in the best interest of the children. Because constantly using this media to market food to children will pose more risk to them. According to Linn, an online poll in Advertising Age reports that about 77% of persons accept that there is a connection between TV ads and obesity in children. With this in mind, it is necessary that food marketing to children be reasonably curtailed. Briggs B. Wallace Hints at Ban on Junk Food Adverts as the Best Way to Fight Obesity Among Young. The Herald. 2003 February i:sect A:i.
Linn, S. (2004). Food Marketing to Children in the Context of a Marketing Maelstrom. Journal of Public Health Policy J Public Health Pol, 367-378. Kotz, K., & Story, M. (1994). Food advertisements during children’s Saturday morning television programming: Are they consistent with dietary recommendations? Journal of the American Dietetic Association, 1296-1300. Otten, J., Hekler, E., Krukowski, R., Buman, M., Saelens, B., Gardner, C., & King, A. (2012). Food Marketing to Children Through Toys. American Journal of Preventive Medicine, 56-60. Pomeranz, J. (2010). 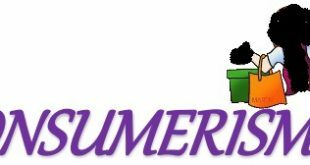 Television Food Marketing to Children Revisited: The Federal Trade Commission Has the Constitutional and Statutory Authority to Regulate. The Journal of Law, Medicine & Ethics, 98-116. Vandewater, E., Rideout, V., Wartella, E., Huang, X., Lee, J., & Shim, M. (2007). Digital Childhood: Electronic Media and Technology Use Among Infants, Toddlers, and Preschoolers. Pediatrics. Please use website name as author/reference.